2018 has been a brutal year for most traders and investors. 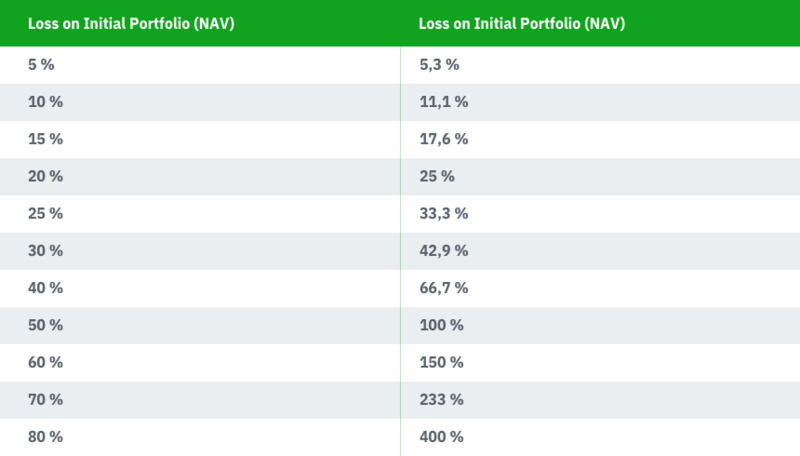 Wild swings and a “sudden” transition from low to high volatility has been a nightmare, resulting in big drawdowns for most portfolios. While most funds focus on asset gathering and trying to be right, they usually lack relevant risk management and methodology how to handle the p/l. If there is anything you should read as we wrap up 2018, we suggest the below market psychology and risk management articles as must reads. The below image of frustration shows what most people have experienced when it comes to trading. Trading is an emotionally demanding profession. Psychology of both the individual, as well as the market itself, constantly affects the decision process. Below is a hypothetical chart showing various phases of a typical trade. The trader enters a long trade, makes initially money, but then it all starts going the wrong way. The trader ends up relying on hope, on what others told him about the stock, that earnings will be good, he doesn’t apply stop losses, feels agony and pain, short term relief, once again hope, guilt etc. The chart displays greed and fear at its best! There are several studies suggesting that majority of day traders lose money. It is important to understand why you are making or losing money. Do you overtrade, do you take appropriate risk, do you make money by being lucky? Traditional financial literature is based on efficient market hypothesis (EMH) that states one cannot consistently achieve returns in excess of average market returns on a risk adjusted basis, given the information available at the time. The theory assumes all available information is reflected in prices, therefore one cannot predict future prices. investors posses feelings, one common term referred to often is herd behaviour among investors that is all but rational. Overconfidence – good periods in trading often make the trader less aware of potential risks and negligent behaviour often leads to falling p/l. Overreaction – positive or negative reactions are usually exaggerated and lead to less rational behaviour. Information bias – focus on relevant information versus irrelevant information, investors are bombarded everyday with tons of totally irrelevant information from media, internet etc. Irrationality itself is unpredictable but cognitive aspects, deviations from rational behaviour are predictable. Remember the old proverb from Keynes? All decisions are based on expectations. Humans base their expectations on hope, fear, good, bad and other feelings. Information from past experiences also form our expectations. Add also new information to the above mentioned and it is fair to say the process of decision making is fairly complex. Consider a trend line for example. Past information and experience tells the trader a specific stock should find support on the trend line and bounce, but trend lines still get broken. Why does this happen? Is this an effect of new information or psychology of humans affecting the trend line itself? Another central concept is the traders’ expectations versus the goal. Every fund manager, trader, financial decision maker believes he/she will beat the market but still most managers underperform (irrespective of fancy charts of Sharpe ratios etc they show you when selling their product). It is actually amazing how non rational the investing/trading space is. There is probably no other industry where the individual performances underperform so much to what the goals and expectations are. I used to run several trading desks and every year all the traders on the desk would try convincing me they would provide higher returns than the previous year, irrespective of market conditions. The belief that one will beat the market (or your past p/l) affects the investment decision process! Overconfidence affects all decision making. There are many fallacies when it comes to how people evaluate opportunities. A classical fallacy is the gambler’s fallacy (Monte Carlo fallacy) where people for example believe that because the roulette wheel has been showing X reds lately it must mean a black is up next? The gambler’s fallacy is present not only in gambling but in trading as well. How many times have traders expected a stock to bounce just because it has traded down X days in a row? The decision process of a trader is extremely complex. The cognitive process affecting all humans always present. Genuine decision making is also often a habit or routine, ie the past influences future decision making. Very seldomly does a trader objectively and rationally make the decision process from the start without incorporating past experience. A trader makes decisions in a stressful environment, bombarded constantly with new information while watching asset prices move in real time. These external factors affect the decision process in a complex way. How many times has a trader been planning to buy a stock, waited for a good entry level but the stock moved quickly, maybe new information hit the market, and suddenly the trader starts chasing the stock 5% higher to then see it revert down after he bought it? These are decisions made under stress since the process is dictated by the environment (the market) and is not a rational, non stressed process. Traders rely many times on their experience, but all experience has a cognitive bias. 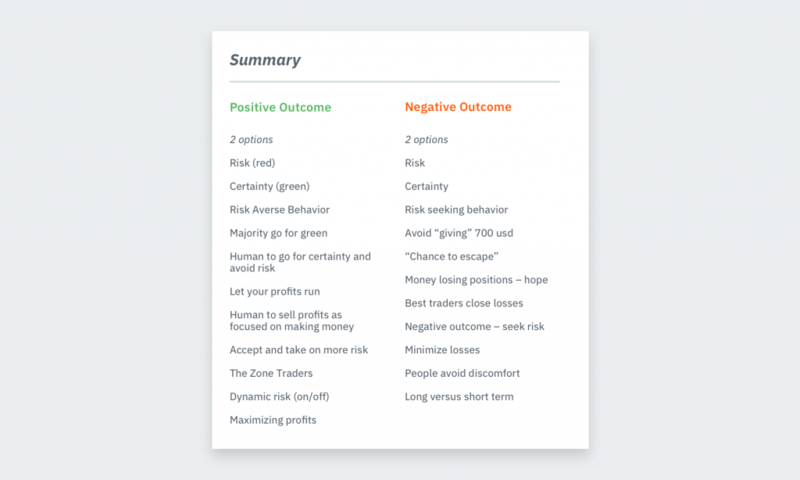 Given two negative options people, one certain and other probable, people choose the probable, even if the expected value is for a higher loss – they have the chance to escape the loss – this is the psychology of stop losses. Stop losses are emotionally hard to digest but should be treated as the most normal aspect of trading. Loss or gain depends on reference point. One example; you buy a stock at 50, it goes to 100 (you feel really great), the stock then goes back to 55. You are still up 10% on your investment but how do you feel? Most people feel they have (almost) lost money since they tend to have 100 as the reference point. Majority go for the second option, people take 700 usd which is certain money in the bank even though the expected value of the situation A is larger. The following example below has exactly the same expected probabilities as the example above but instead of certain outcome we have changed it to being an uncertain event. In this example where there is a possibility of losing people tend to go for option A. This gives them a possibility of escaping the loss, despite the probabilities in favour of the other option.